New offer! 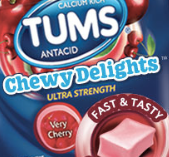 Hurry over to Target.com to score a FREE Sample of TUMS Chewy Delights (you may un-check the email boxes). Allow 8-10 weeks for delivery! Previous post: Amazon: Rhinestone Peace Sign Symbol Necklace – Only $1.59!